Rather like a brand that disappears from the high street cycling has it’s own reference points for forgotten teams, bikes and components. 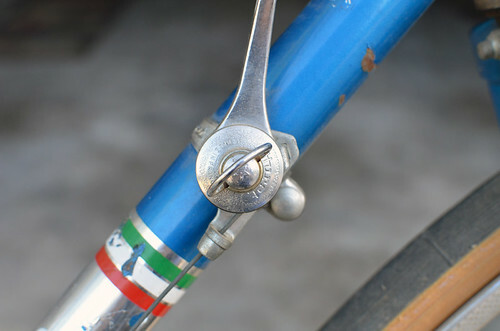 A staple of the racing bikes of 30-40 years ago would have been derailleurs made by the french company Huret. This should be qualified by saying that the bikes to which Huret gears were fitted were probably pitched and priced at a level of today’s Shimano 2300 to perhaps Tiagra. High end racing kit would feature Campagnalo or similar, but it seems odd that a brand that was once as ubiquitous as Huret was ceased to exist so suddenly. Or perhaps not. From the research VCSE has carried out, we have learned that Huret didn’t just ride off into the sunset accompanied by the sound of un-indexed gears shifting. In 1980 Huret was bought out by the German manufacturer Sachs who rebranded the business Sachs Huret. Sachs is perhaps better known as an automotive company and a portion of the company continues in this sector. The bike component element that swallowed Huret 30 plus years ago was in turn consumed by SRAM in 1997. SRAM purchased the business from Mannesman better known as a telecoms company in Germany. SRAM’s motivation for the buy out was that Sachs had something SRAM wanted, the suggestion being that SRAM preferred to buy companies that already had well developed product lines. Recalling the 5 speed Huret that VCSE owned and later on the 531 framed 10 speed Huret Carlton VCSE wonders if there’s the chance of a Huret revival as an entry level groupset for SRAM. Sadly VCSE doesn’t have any photo’s of these old bikes and a trip to the garden shed years later revealed that the Carlton was no longer mothballed, perhaps donated to a budding Brad Wiggins or connoisseur of classic steel frames. Does anyone else remember Huret? Did you have any Huret gear on your bike? Tell us by adding a comment below.